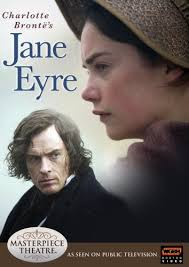 Charlotte Bronte’s 200th birthday last year inspired me to re-read Jane Eyre, and I decided to make this part of my Read Harder Challenge by watching two film adaptations for comparison to the original text. I’d been meaning to re-watch the 2006 BBC version with Toby Stephens and Ruth Wilson, and I’m always eager to watch the 2011 theatrical version with Michael Fassbender and Mia Wasikowska. What a pleasure to read the book*, watch both adaptations and compare! It also was great fun to pair the book with tea and a sweet treat, as you’ll see below. I’d forgotten that both the 2006 and 2011 adaptations were filmed at Haddon Hall in Derbyshire (as was the 1996 Franco Zeffirelli version with William Hurt and Charlotte Gainsbourg!). I’ve visited Haddon Hall in both the summer and at Christmas time, and it’s one of my favorite old piles in all of England. It seems perfect for Thornfield Hall–castellated and gloomy in a Gothically romantic way, also boasting a rushing stream and lovely terraced gardens. The 2006 version makes a little more use of the Haddon Hall interiors, whereas the 2011 version uses Broughton Castle (another lovely place to visit!) for many of the interior shots. The 2011 theatrical version is stripped-down, but effectively so. I like the Rivers family as a frame, and I do prefer Fassbender’s darker Rochester–he has a bit more menace to him and doesn’t babble so much as the original. 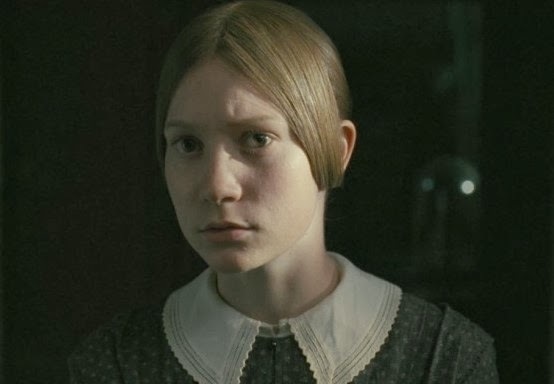 Mia Wasikowska truly does seem little and plain(ish) in this adaptation, but also strong-willed. I think the scene that really seals the 2011 version as my favorite is when Rochester begs Jane to stay after the revelation of his dark secret. “I cannot get at you, and it is your soul that I want!” (Watch the scene–you know you want to!) I also love the ending–very compressed from the original, but somehow more satisfying to me. I’ve probably mentioned my Haddon Hall china from Minton before. 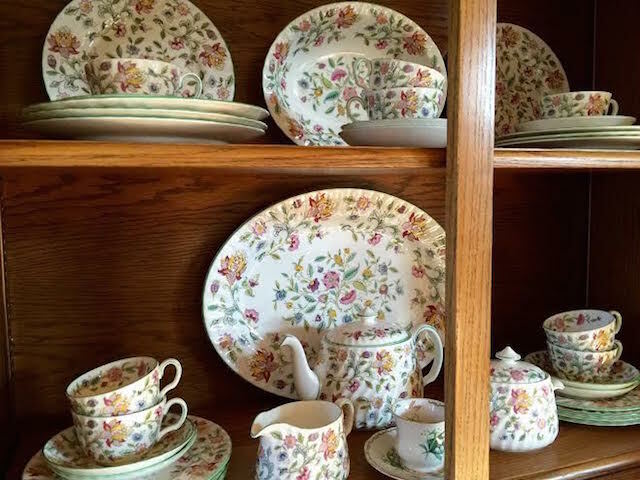 I first saw the pattern at the Haddon Hall gift shop, but it just wasn’t feasible to ship a set back to the U.S. Fortunately, I later found pieces from various sets at Replacements.com. They don’t match perfectly, but I think that makes the collection all the more charming. And, of course, the Haddon Hall china seemed perfect for a Jane Eyre tea! 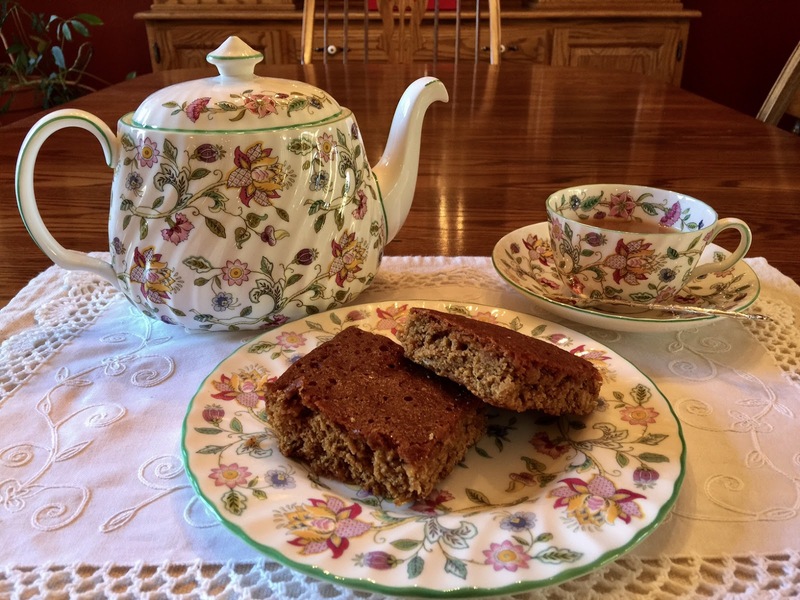 For my tea treat, I made parkin, a spicy oat cake from the north of England, particularly popular in Yorkshire (home to the Brontës). It looked a bit like a pan of brownies when it came out of the oven, but oh, the glorious spicy smell! 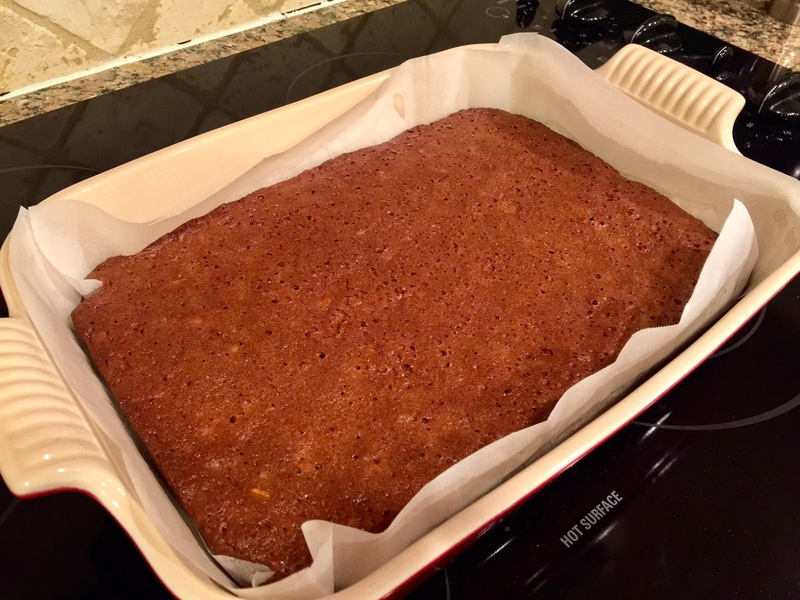 This parkin was very moist and filling. If Jane Eyre had tucked some of this in her pocket, she might not have suffered so much on the moors before the Rivers family took her in! For tea I needed something strong to match the spice of the bread, so I chose the Irish Breakfast from David’s Tea in honor of Charlotte Brontë’s Irish heritage through her father, Patrick Brontë (originally Brunty or Prunty from County Down, Ireland). —Jane Eyre Tea Cozy patterns for knitters! –And finally, this long-time favorite: Dude Watchin’ with the Brontës from Hark, a Vagrant. This entry was posted in Reading, Traveling, Watching and tagged Bronte, Gothic, Jane Eyre, movies, reading, tv on January 18, 2017 by SoniaG. I finished a first draft of my latest project, which had been dragging on FOREVER. The ending is a bit sketchy, but at least I have something to work with, so YAY! I am very good at rewarding myself for finished tasks, and this weekend was no exception. 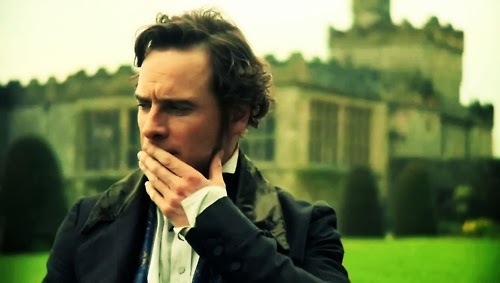 Friday night, I re-watched Cary Fukunaga’s Jane Eyre (2011), my favorite of all the adaptations. It’s no secret that I adore Michael Fassbender. He’s probably too handsome for this role, but he has such a lovely intensity. And he can be ugly when the situation requires it. I love the early scenes with Jane in which his face tightens, his mouth flattens into a sneer, and his eyes flash with contempt for the world. And Mia Wasikowksa is appropriately small and plain, but also projects the necessary fierceness. It is only in this adaptation that I fully experience the seductiveness of Rochester’s attention to her, and the tragedy of having to walk away from the freedom, inspiration, and affection offered to her at Thornfield. 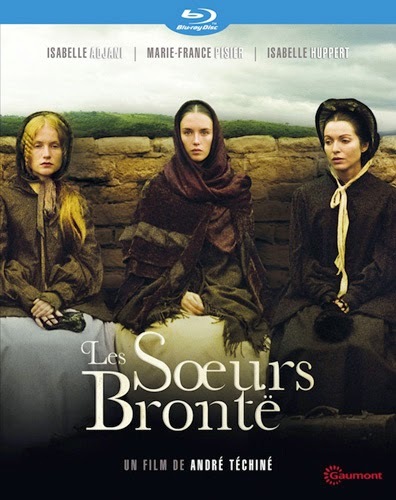 I also watched Les Soeurs Brontë (1979), which has become available on US DVD only recently, as far as I can tell. (I bought it on Blu-ray.) It’s a beautiful film, shot partially on location in a way that capitalizes on the wide, bleak vistas of the Yorkshire moors. I’d gathered in advance that the film was more about Branwell than the sisters, but I still found myself resenting the time devoted to his addictions and failures. In the documentary that accompanies the feature film, the director states outright that “in the final version of the film, it’s like a vampire story, if you will, or virgin-vampires, in a way, who appropriate and accomplish the artistic destiny of their brother.” BLECH! One could argue that Branwell was the one with the most external conflict, the most drama, and that his life translates better to the screen. As Claire Bazin says in the documentary, the imaginations of the sisters “were fertilized and developed by an interior richness, by their internal life.” How do you represent that rich interior life on film? I don’t know. What films have effectively represented the dramatic interior life of a writer? 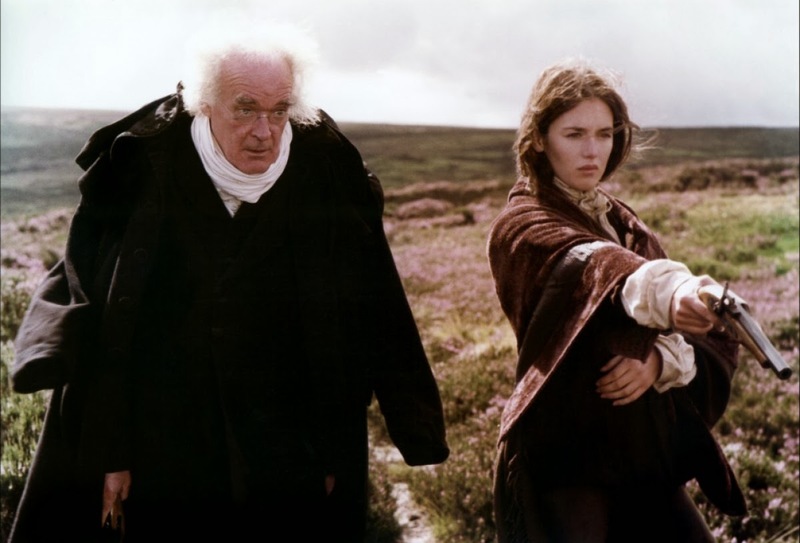 Surprisingly, Emily Bronte was my favorite character in the film, and it wasn’t just because (in this incarnation, at least) she liked to roam the moors in trousers and shoot guns. She was strange and passionate–a true brooding heroine. I never knew or had forgotten that the titular heroine of Charlotte’s Shirley was based on her. I am not a fan of Wuthering Heights or Emily’s poetry, but I think I would watch the heck out of a film that was mostly about her. Isabelle Adjani was absolutely mesmerizing to watch (and you can bet I’ll be watching La Reine Margot and Camille Claudel ASAP). I need to watch again, but for now my verdict on Les Souers Brontë is that it’s a must-watch for obsessive Brontë fans, but may also be of interest to French film buffs. The cinematography is gorgeous. In other news, I hope something comes of this notion of a BBC Brontë biopic (mentioned in 11th paragraph). This entry was posted in Reading, Watching and tagged Bronte on November 11, 2013 by SoniaG.